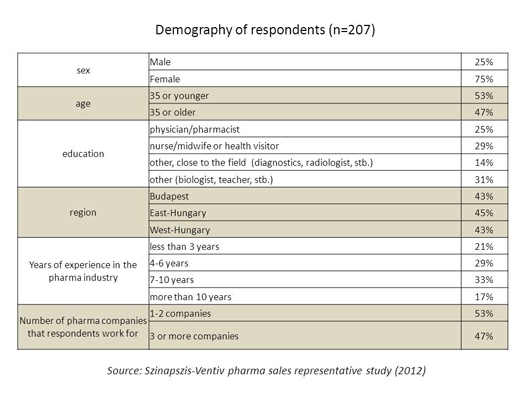 Additionally, global trends of using alternative communication channels with physicians, pharmacists can be detected in Hungary as well. Pharma companies have to at least consider applying these tools and solutions. In a state like this it is crucial to know how do representatives experience these changes, what do they think of the future of their profession, and how do they view digital solutions. To gather some insights about these questions, Szinapszis partnered with Ventiv in August 2012 for an online survey among sales reps. Out of 1600 sales reps 207 responded both original and generic companies. Participation was voluntary and, of course, anonymous. 9 out of 10 reps said to feel the negative effects of the legislations at the workplace, most of them citing drastic consequences, disadvantages. Maybe it is not surprising that 70% of them are completely against the changes in health policies, questioning even their necessity. In general, sales reps feel their situation is uncertain and hard, and many of them find the expectations of management unrealistic. 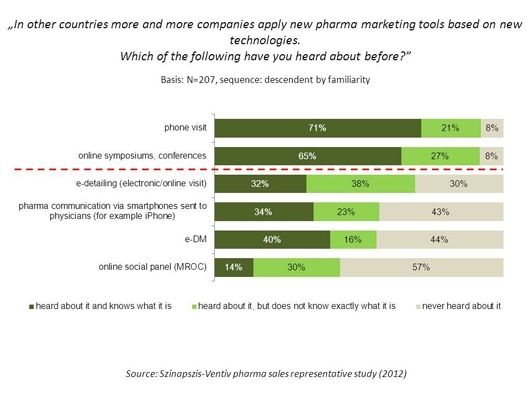 Although almost all of them feel their field is about to change, they think of visits and sales representation – still –as a crucial element of pharmaceutical marketing. Although the majority of respondents agree, that reps have to keep up with new marketing solutions, the alternative ways of communication are not widely known among them. The level of education of respondents is a significant factor in this question: the need for being up to date is emphasized mostly by nurses and midwives, while physicians, pharmacist, and especially older specialists generally do not share this view. 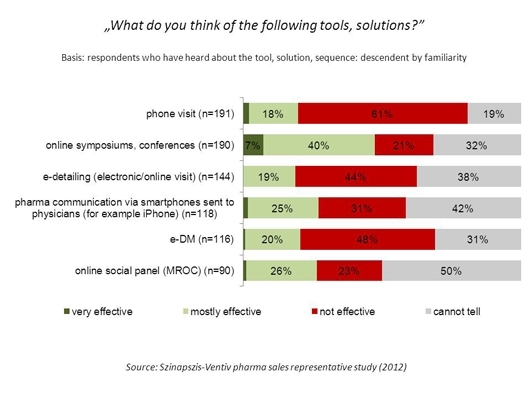 Most of the Hungarian sales reps have heard about phone visits and online symposiums, but other tools are less known. Ratings of the effectiveness of alternative communication solutions are considerably negative, while there is a large group that do not have the information about these tools to form an opinion. In some ways the attitude of sales reps towards alternative communication can be considered normal. 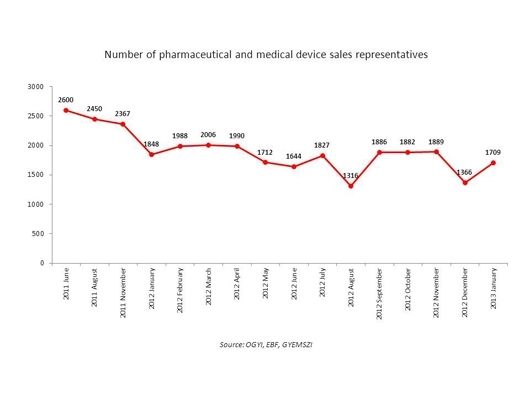 In an uncertain market environment, like our local pharma sector they view these tools like their enemies and not like possible solutions furthering their work. To make reps accept these alternative ways and to implement these solutions will be a big challenge for marketing-sales leaders. It is already clear that to be successful, enough time and resources need to be spent for the introduction and familiarization period. Based on the results of the study the general feel and attitude of the sales sector signals that there will be challenging tasks to be completed for HR specialists as well. When working with the remaining sales group, crisis management and the support of individual approvement and career advancement will be in focus. It is also clear that the anamnesis of sales reps – number of years spent wotking in the sector, professional experience, and especially the level of educaion – is significant and requires different managing and coaching.